Phew! This tea has so many incidents of what a tort lawyer might call "passing off" that I don't know where to begin. Let's start at the top. A wise man once said, "I won't buy anything from a factory with 'Menghai' in its name, unless it's Menghai Tea Factory." This is sound advice. There are approximately 6.022 x 10^23 tea factories with "Menghai" in their names, and 1.0 of them produce good tea. 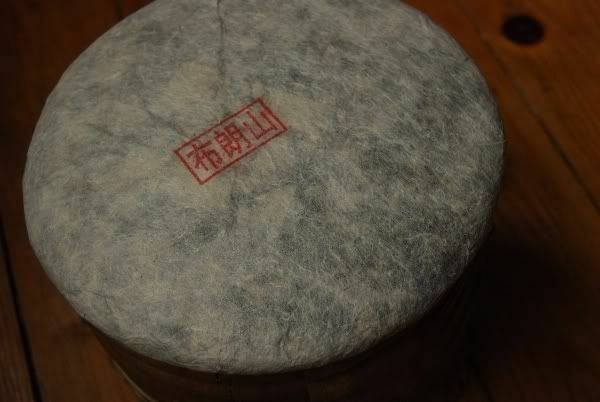 So, let us consider "Menghai Pengcheng" (Menghai Peng Chen, at Puerh Shop), a factory so rare and obscure that it isn't even in Babelcarp (at the time of writing!). Before we consider the name further, allow me an apostrophe. I have much for which to thank my school (probably what would be called a "High School" in American), but of particular note is the fact that they made us read quite a few of the Chinese classics (in translation - we were just babies). This came in particularly handy when strolling on the beach at a conference with a lovely lady who would eventually become suckered into being my wife. We studied a bunch of great texts that I honestly believe that most people would benefit from reading (Laozi, Liezi, Mozi, Kongzi/Confucius, some of the Yijing), but my favourite was Zhuangzi, the Daoist chap who wrote really witty material, following the Daodejing. I'm frivolous by nature, and Zhuangzi appeals to me. Near the start, he describes a huge, mythical bird-like creature called the "Peng", which travels bazillions of miles with its huge wings. There is a phrase in it, "Peng cheng wan li", meaning approximately "The peng journeys 10,000 miles". This has come to be a synonym for describing success in Chinese, perhaps a bit like the English "He's come a long way", or "He'll go far". So, the two characters "Pengcheng" refer to this common saying. I instantly became impressed that the tea factory would name themselves after a phrase in the Zhuangzi, given that my prior assumption is that all tea factories are run by oily merchants with little interest in the classics. (Harsh, but fair.) However, my dear wife brought me down to earth, saying that the phrase "Peng cheng wan li" was in such common use that it would be like someone using a common Shakespearean phrase, probably without knowing its origins. It's minutiae like this that divert me for hours. 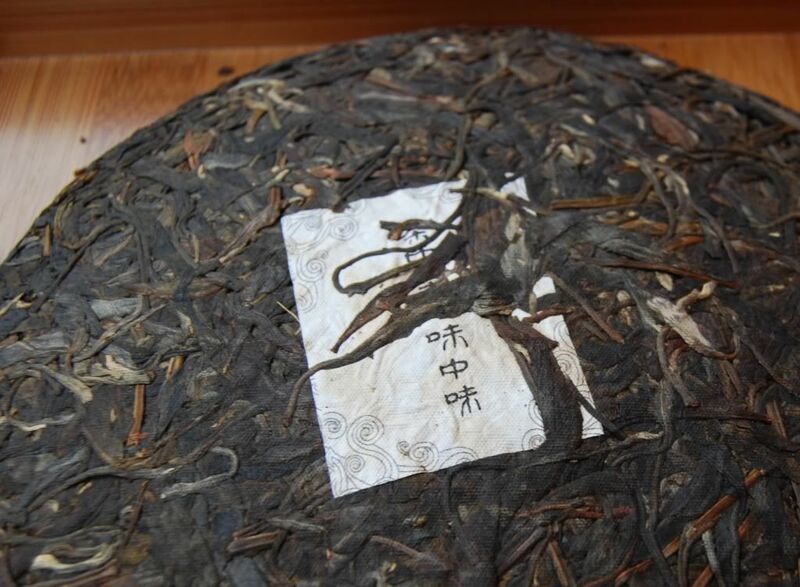 This has been labelled "yuanyexiang", translated characterwise as "primeval wild aroma" by the mighty Babelcarp. I think this time, I'm with the Puerh Shop translation, which has "prairie bouquet", noting that "yuanye" is a compound, which refers to open country, the champagne or campania. My Chinese language book wisely states, "Ask not how many characters a person knows in Chinese, but how many compounds." So, I would translate "yuanyexiang" as "Open-country aroma" or something along those lines. It's the scent of the great, unkempt outdoors. 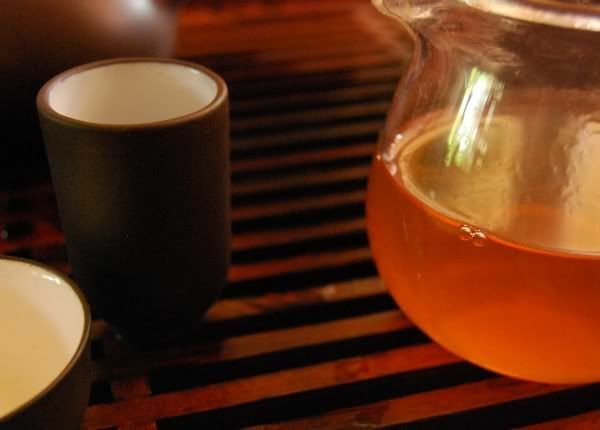 This is the second instance of passing-off for this tea, because it cannot be coincidence that it refers to an appelation made rather famous by Shuangjiang Mengku, and others. Finally, in the centre of the bing, we have the ubiquitous characters: pu'er wang [pu'er king]. Before we even look at the leaves (above), we have a whole mountain of prejudice, bias, and a priori assumptions to overcome. It is overwhelmingly likely that this tea is poor. I would be happy to be proven wrong... but Ouch's Menghai rule (see above) is seldom wrong. Let's find out. The leaves are small, with compression typical of a machine-pressing. They are a touch dark, and the few tips present in the blend have turned a beige colour, placing it around the 4-5 year mark, which may not come out too well in the photograph. The aroma is decent: full sweetness, with a body of grain. It has some spicy greenness about it that I usually associate with cheaper teas. The first infusion is cloudy orange. 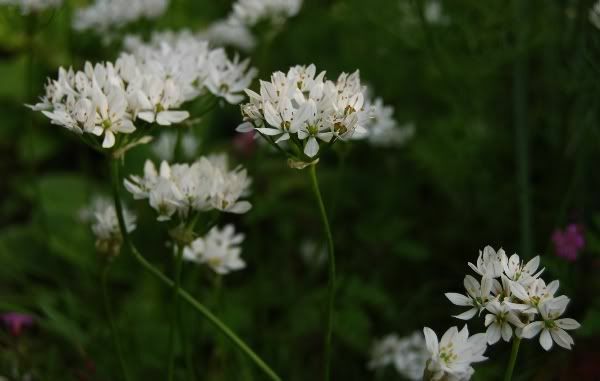 The aroma is generically sweet, but in the mouth it is instantly and aggressively green. 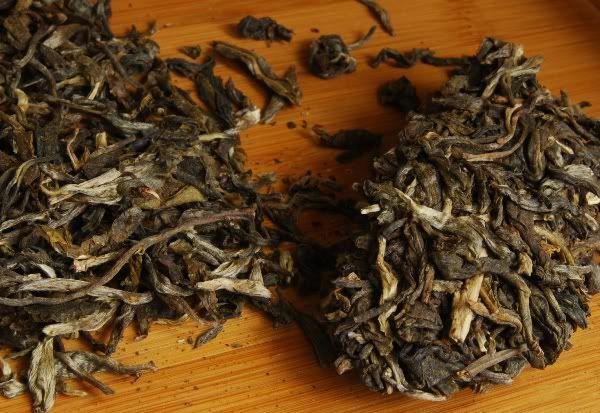 The product page notes that the leaves are from Bulang, and I can believe it, because this tea is heavy going. It isn't punchy, clean, and fresh, like the 2009 Nadacha "Bulang Qiaomu", instead being the brutal harshness of the plantation. It's raw, and it hurts the throat. There is a sweet, grain character that was in the dry aroma, but not too much else. It reminds me of regular production Xiaguan, rather than their specials. 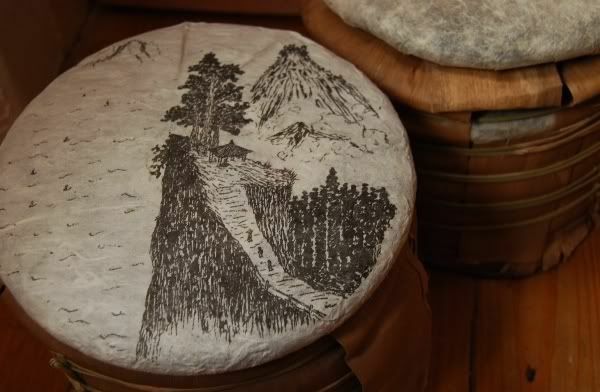 At $23, it isn't too expensive, and Puerh Shop deserves credit for that. Is it good for aging? Well, it is brutally astringent. If you believe that's what ages well, then go for it. I tend to look for some content and complexity underneath the brutal power, and this tea just seems too raw, too rough, too nasty, and with too few other contents. After five infusions at home, I tire of its one-dimensional agony, and take the remainder to work where it serves as a low-maintenance background tea. Thanks to GV for passing this one on to me, as it's nice to sample from all ends of the spectrum. Remember the "Rule of Menghai" and you won't go far wrong! I've been getting reacquainted with my 2007 12 Gentlemen "Yiwu", after a year in storage. The new article has been appended to the original post, to keep my notes in one place. See you there! 2008 Haiwan - Laotongzhi "8808"
I continue to supply propaganda concerning my plans for a garden tea-house to my dear wife. I've found some beautiful little hexagonal wooden structures that look suitably rustic and chunky. 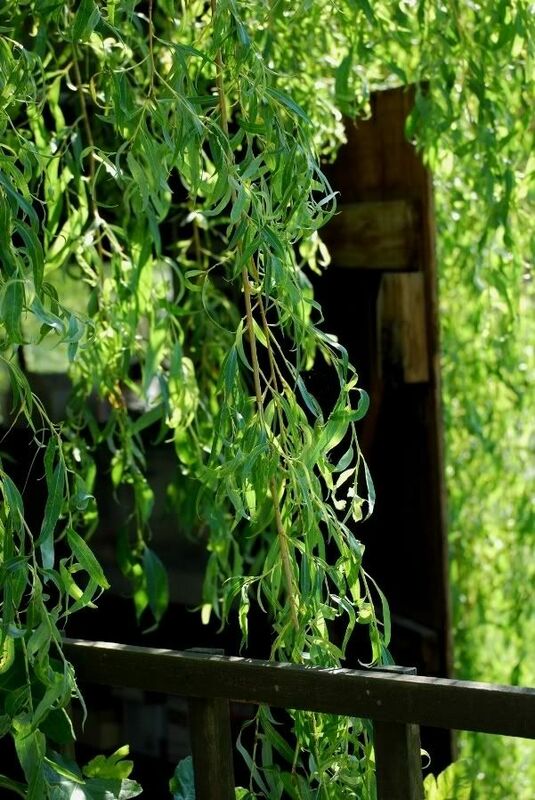 We could tuck it under our willow tree, which acts as a sweet little hideaway - a perfect place to avoid it looking too showy and naff. I still haven't found that ultimately convincing argument justifying its purchase, though! Any ideas? Haiwan. I usually steer clear of Haiwan. Walk around Beijing's huge Maliandao districts, and you'll see that every single shop window contains (i) CNNP and (ii) Haiwan "Laotongzhi" [LAOW TONG DJER]. This isn't a mark of quality, given the immense mediocrity of most Maliandao shops' offerings. That said, I've had some decent Haiwan, such as the 2006 "Mengpasha Organic" that has been doing the rounds of most of the on-line vendors. My overall feeling with Haiwan, though, is much like my feeling to, say, Mengyang Guoyan, 6FTM, Nanjian, or even the mainstream (non-Muyechun) releases from Shuangjiang Mengku: the occassional nice one, but mostly mediocre filler. (I place modern CNNP below these.) Maybe you've found some particularly nice examples from these producers - they do exist, and I've enjoyed each label from time to time. Overall, though, I've felt that they're a bit disappointing. So how about this 8808? 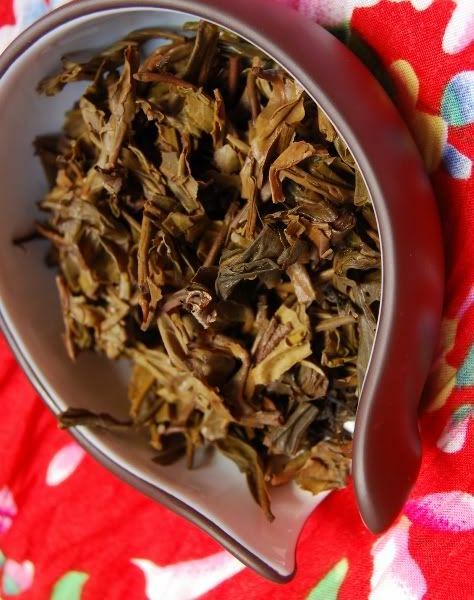 It sells for $14 at Yunnan Sourcing, and the leaves look rather nice (shown above). The product description reads "ultra-premium", referring to the '0' grade number in '88-0-8'. 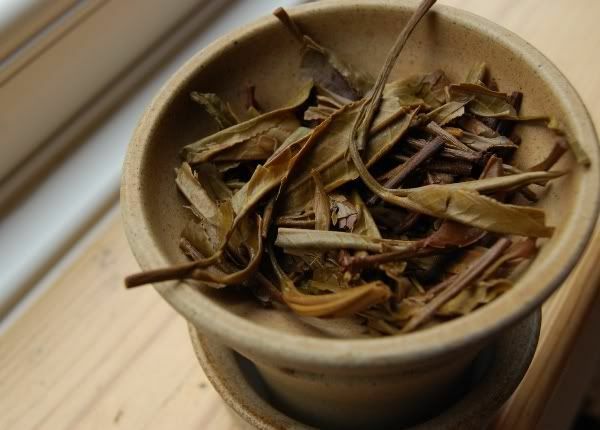 These grades should only be taken as a broad description, as there is no standardised meaning - nor does a low number (and hence smaller leaf) imply better quality; I prefer a range of leaves in a blend, from tippy small numbers for sweetness and smoothness, to bigger basis leaves to provide a chunky, flavoursome, undercurrent. What does "ultra-premium" mean in this context? Who knows - the leaves are small, and fairly well handled, but there is quite a bit of breakage, as you can see above. It looks like it's mostly a marketing point rather than a real process indicator. C'est la vie! What is important is the content of the tea. This is most definitely a plantation tea, as you could assume from the price, and it's very good to see that the product description doesn't make any claims to being old-tree. I'd put this down as a decent daily tea: it has some decent character - general sweetness, some mushroom, a fairly solid body - and is priced quite low. The real question is - would I buy any? Even at the bottom-of-the-league price of $14, you can get a lot more for your money, I think. If you're after solid plantation teas at a low price for daily, low-maintenance drinking, I prefer the old staples: Xiaguan or Menghai. If you're after a tea for storage, I don't believe that this tea contains enough interesting content. What's going to happen to a $14 cake? The power is... OK. The flavour is... OK. The sensation in the mouth and throat is... OK. It's an "OK" tea. I can imagine this tea becoming bland over time, rather than anything beefier and more interesting - but only time will tell. Your guess is as good as mine. In the end, this tea didn't change my mind about Haiwan, and I will continue to avoid them unless someone finds a gem. The "ultra-premium" status is obvious in neither the leaf nor the brew, and as my sample comes to an end, I won't miss its passing. It gave me some nice infusions in my office, though, while I got on with something else. P.s. Lei and I are off to a conference in Hibernia, so we'll see you in a week's time. A fellow pu'erist, Dr. GV, and I have been making plans to meet up for what seems like an aeon - each time that we have a date set, we are thwarted by unforeseeable obstacles that crop up at the last minute. Our universities are only about 1.5 hours apart, which makes it all the more amusing that we must have sampled the majority of each other's tea collections by now without actually having met. We'll get there, GV! 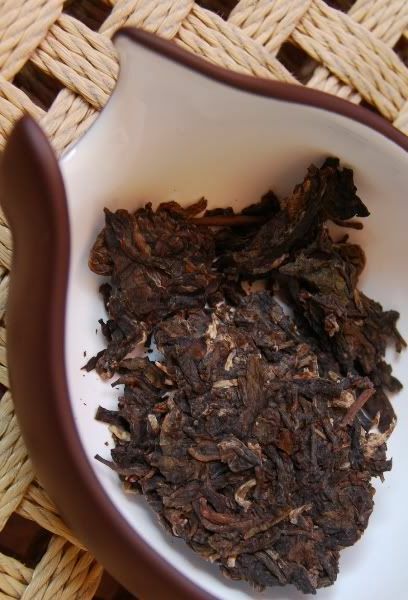 Continuing this long-standing tradition, I settled down to enjoy a mysterious sample labelled "2004 Taihe" [TYE-HER], a bing of which GV bought in Taipei from a trustworthy chap who acquired it from Yunnan himself, and who described it as being laoshu [LAOW-SHOO - old tree]. So far, so good! I've not come across Taihe before. Interesting leaves, no? They are wirey, thin, and brittle. I can believe that they are from 2004, given the colour, which is well on its way into orange-brown territory. This is a tea which speaks volumes just from the dry leaves: their aroma is slightly sour, slightly thin, straw-like, and reedy. 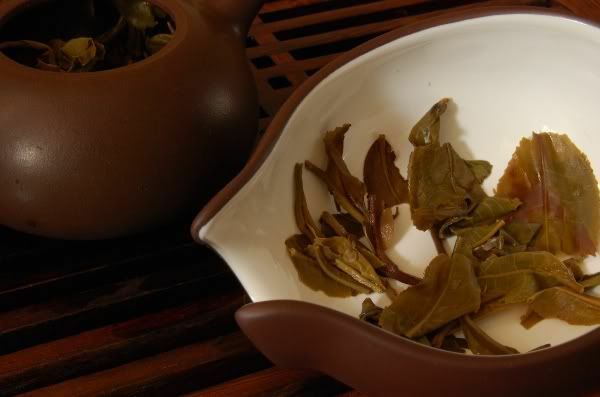 This precise character comes out in both the wenxiangbei [aroma cup] and in the flavour. It is a touch sour in the throat, and the texture is thin and distant. As suggested by the colour of the leaves, the soup comes out a slight orange (pictured below). It's quite surprising how much can be determined from just the dry leaves alone - and quite encouraging! The flavour, as you would hope, is a woody, spicy affair - it is definitely on its way to maturity, and is showing encouraging signs of change. Heaven knows why, but I was up at 4 a.m. when I drank this tea, and it lifted me up and calmed me down at the same time. Some roughness around the edges suggests that this might not be 100% pure laoshu, and GV and I have been discussing the thin character - even when initially transferred from Taipei to Blighty, GV observed a decrease in potency, and it seems that this has continued. It is an interesting, and slightly concerning, effect that we all hope to avoid - the disappearance of character is none too desirable. The rapidity of its decrease is the real puzzler, though. I used a very large quantity of leaves, and it still seemed thin, and required excessively long infusion times as early as the sixth infusion. The somewhat sour character prevented me from really enjoying this one, but it was a definite education. I'd like to get a better handle on its decrease in potency, so that we both can avoid such effects in future. The leaves from this bing are tiny little fellows, throughout. Nada wrote on his web-site that Nakashan (near Mengsong) is famed for its wee leaves, and that these are from 400 year-old trees. 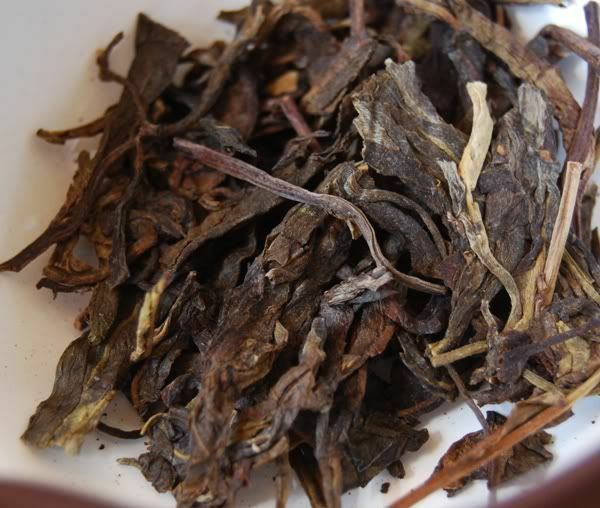 Given the longevity and lack of roughness in his Yiwu Mahei, Bulang, and Nannuo, I am hoping for more of the same here. Whereas the Bulang assaulted the nostrils the moment that the wrapper was opened, this is more standard: gentle sweetness, a little green. Clean and fresh. The soup, as you can see above, is a pure yellow. Unlike some active teas, however, this does not rapidly turn to orange - it stays a stable yellow throughout each infusion. 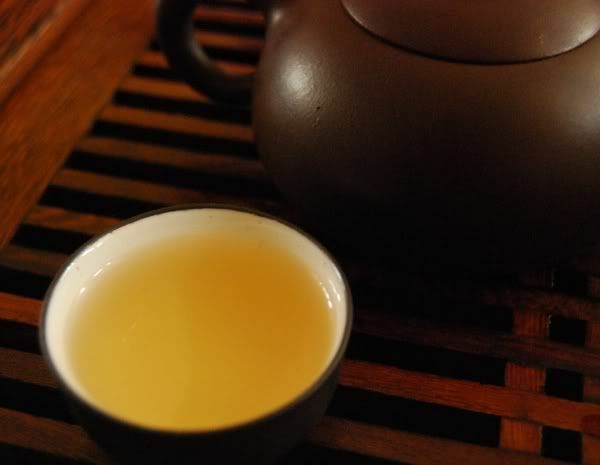 The aroma is so sweet and buttery that it reminds me of wulong, absent the concerns of cheeky pre-shaqing [kill-green] oxidation, as shown by the pure yellow soup. It is super-clean, extremely vivid, and contains a swelling sensation into a very decent huigan. This tea reminds me for all the world of a pu'er version of Xinyang Maojian, one of the "10 Famous Chinese Teas", and the local brew in my wife's family home. Creamy, green, sweet. As with Nada's other 2009s, it lasts forever. I took it to my office after an extended session at home, and was reinfusing it all day until the time I went home. It actually affected the quality of my sleep, such was its potency. A note of warning: it seems that this tea is very sensitive to water, or preparation, or both - certainly moreso than most others. With the water that I use to infuse in my office, it was flat and merely sweet. Back at home, it was the complex, fresh affair that I describe in the above. Grass-like scents, with a sweet flavour of low grain, and tons of bitterness. This is a fine cake that continues to march on strongly. A lovely, complex, and powerful tea that is alternately sweet, rich, savoury, and bitter. I love it, and am relieved to see that it is responding well to our house. This tea is now red-brown, and has obviously aged. It has moved towards the red, candy-sweet end of the cale, and has a background of lucha - actual green tea. This suggests a fault in the processing. It could be, perhaps, that it is merely caught at the wrong moment, in its adolescence, before becoming "aged". It is energetic on the tongue and has a heavy body. I am pleased to taste that it is not "dry", and that our humid climate may be helping to avoid such extremes. This cake - one of a tong - clearly needs more time, but seems to have the fullness of body to improve. Brewed quickly, it is cooling and bright, with a candy-like, sour-straw body that really needs another five years. EoT is clearly selecting and processing better teas in recent years than in these formative times. Fans of classic British drum'n'bass will be familiar with the collected works of one Richard D. James, a.k.a. 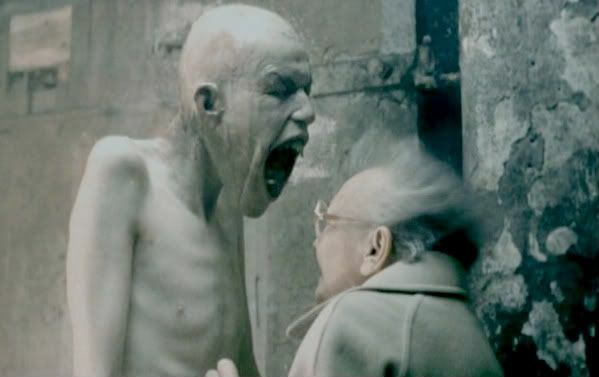 the Aphex Twin, and with his magnum opus "Come to Daddy" in particular. I think it's fair to say that this tea wakes you up. The chunky, coarse wrapper (shown above) reads "Bulangshan". Opening the wrapper, and you are greeted by pungent, spicy, apocalyptic aroma. Amusingly, the entire cake flexes very easily, as if it has no backbone. It flexes as much as +- 20 degrees from its plane, and feels soft. The leaves are lovely things: big, soft, and hairy. 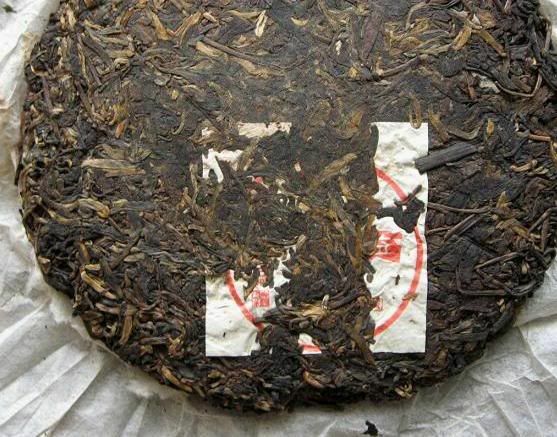 There are quite a few tips in the cake, and the maocha is homogenous throughout, rather than being padded on its outer faces. The aroma cup holds grapelike, candy scents that lull me into a false sense of security. The pyrotechnics begin in the pinmingbei [tasting cup], where the touch of the soup on lips and tongue causes fizzing and energy. Most obvious of all its characteristics to me is its chunky grain-like body, which almost tastes like fresh, clean hops as would be used to make a good ale. 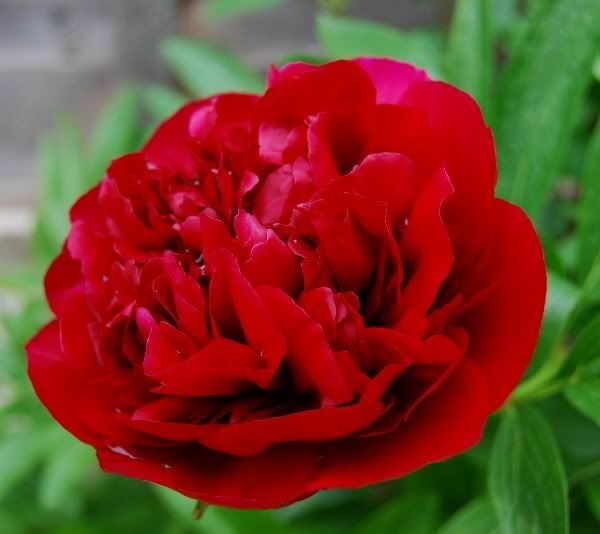 It is so very clean, and entirely absent of any roughness in the mouth or throat, which is remarkable. 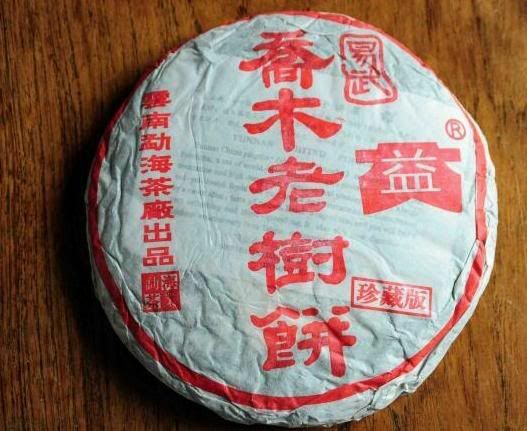 Nada wrote that the maocha was pure old tree, and it's easy to imagine, given the purity of its soup. I took ten infusions at the tea-table, this being a slow Saturday, and am now on infusion 17 in my office. The tea shows no sign of giving up, and continues to be sweet, clean, grain-like, and massively potent. "The taste is deep and mellow, I'm glad we bought it. The bitterness is not like normal bitterness." So sayeth Lei, referring to the bitterness that piles into the throat, but which feels entirely positive. I recommend trying a sample of this tea, in order to, at least, get an idea about actual Bulang flavour. It is unusual to be able to buy an actual laoshu [old tree] cake with any certainty, but for the £24 asking price - very nice. Addendum: I'm currently on the 32nd infusion, and they're taking about 15 mins per infusion at the moment. It is sweet, smooth, and still very flavoursome. It is genuinely remarkable how much content this tea has after so many infusions. I haven't come across many teas with such longevity. The lack of roughness allows plenty of leaf to be used. Strong, sweet, and smooth. Its kuwei remains, and perhaps its body has darkened and quietened a little. This cake appears to be doing well. At the request of a few teachums, I found this cake. I drank this cake. I was hurt by this cake. Then, on returning to this page, I put two and two together - I had failed to realise that the 2009 Nadacha Bulang is indeed that cake with the "Come to Daddy" video. I should have guessed. Honestly, this cake is powerful. It is really rather powerful. Being full of bravado and optimism, I plucked off a goodly amount of leaves from the bing - I drink a lot of leaves in one sitting. However, within one infusion (actually, within the first cup of the first infusion), this tea had humbled me. It knocked me down in one punch. A single, one-inch punch. I'm on the ropes, nursing my jaw, a bleary mixture of confusion and surprise in my eyes. What happened here? Was it the proverbial truck that just hit me? I immediately removed > 50% of the leaves from the pot, hitched up my petticoats, cried into my handbag, reapplied my makeup and then rebrewed. The result, while strong, was at least consumable. Five years have aged this cake. It is softer at the edges; it is mellowed in its pu'ercha way; it has the curious mixture of raw power and woody age that seems to come from aging cakes in a cool-yet-very-humid climate (such as my home). Were I to write that "drinking this tea is like drinking battery acid", most readers might be tempted to conclude that I do not like it. The truth is the opposite: battery acid is something for which I seek. I mean good, real battery acid - not the harsh, brazen acidity of nasty processing or agrochemicals. This Bulang cake is like... Luca Brasi, from the Godfather. And he emphatically does not sleep with the fishes. Fakes are everywhere in China, a product of the fact that regulation is even more "light touch" than that of certain infamous Western economies. With lack of oversight comes all manner of curious practices - in China, this is exacerbated by the fact that corruption is absolutely systemic. 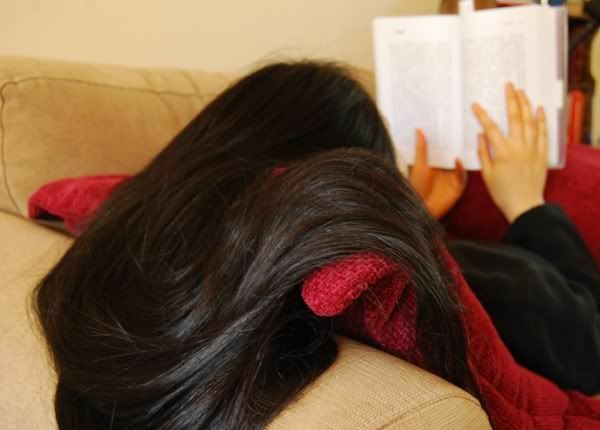 I have a friend who was almost prohibited (via typically off-the-record practices) from taking up her place at a famous Beijing university because her father refused to pay his local party official the prerequisite, under-the-table sum of money. The father is an engineer - what a hero. Stick it to the man cadre, Mr. Engineer! 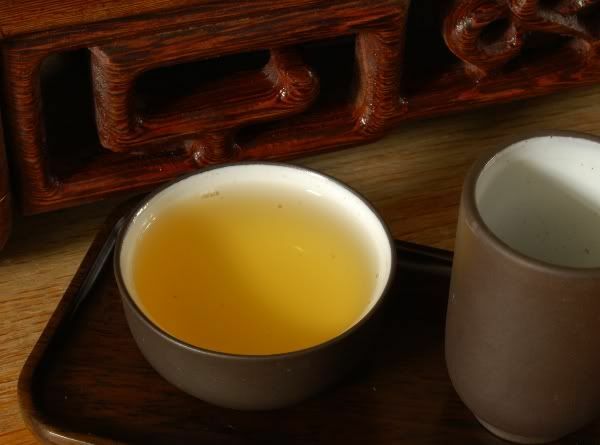 In tea, as is often reported, this means that the buyer has to take particular care. 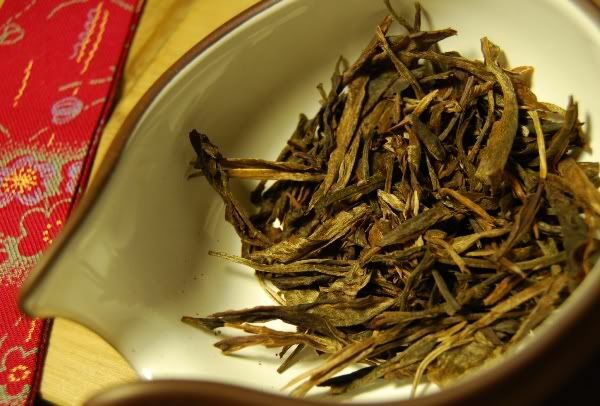 With almost every bing under the sun claiming to be qiaomu [arbor] laoshu [old-tree], it comes down to the buyer to determine the good from the average from the bad. Not every cake on earth can be GFLTS+LOYS*. And so it came to pass that the generous DJC (a.k.a. TacoBell) came across this cake, bought by a friend for approx. 100 of your Federal bucks in Beijing, samples of which he kindly sent out to a few teachums. Chubby! Look at that fat little fellow! It's the kind of tea you want to poke in the belly and make patronising jokes about. The wrapping looks a bit loose, too. I've read some criticism of the printing on the wrapper, but it looks fairly standard for the Dayi Qiaomu Laoshu to my eyes. I could be wrong! ...which is much more in line with expectation. Skip4Tea has the same ($75). We can see the chopped leaves, the matted pressing over the neifei, the regulation thickness of the Dayi mould. By comparison, the cake from DJC has charming, glossy maocha. My sample is shown below - and it looks mighty tasty. I don't know about you, but those leaves are very attractive to me. 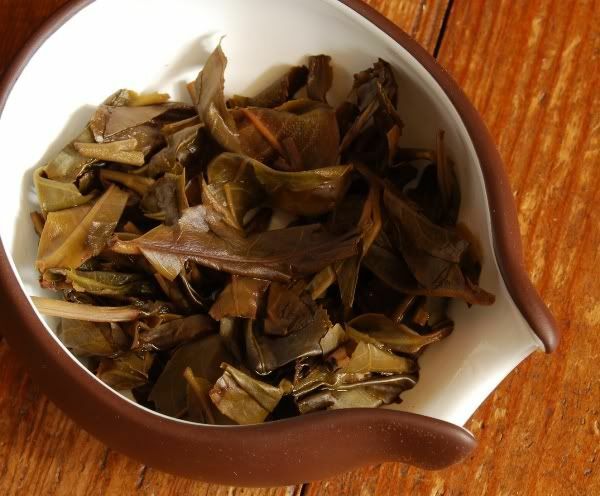 Unlike Dayi, it has a high proportion of huangpian [yellow flakes] left in the maocha, unseparated from the regular leaves. There are stems aplenty, too. The whole affair looks much more small-scale, and actually seems nicer to me than normal Dayi. The aroma is a touch damp, which might explain the oily excretions soaking into the neifei. The quality is decent: it pours a straight yellow, which oxidises to orange while I write these notes in my diary, indicating decent activity. 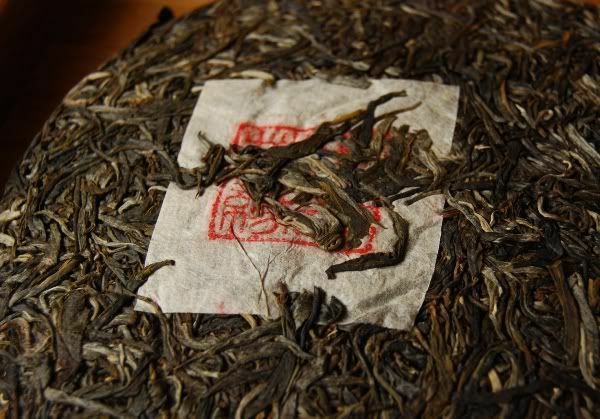 The aroma piles on for ages in the wenxiangbei [aroma cup], which is another positive indication of content. 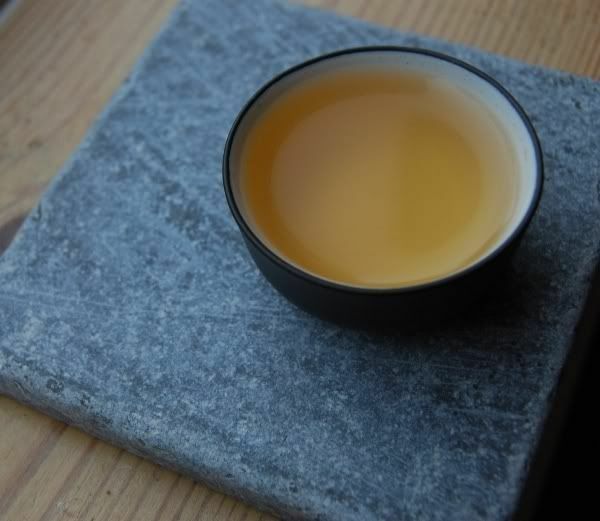 It's a nice little tea: sweet, flavoursome, good texture, decent huigan, and rather energising. "It's alright", says Lei, unimpressed. It doesn't last very long, fading after six or so infusions, indicative of taidicha / plantation tea, but it lacks the roughness associated with bad plantation tea. Its character reminds me of generic Yiwu-area maocha. I liked it! What could it be? Someone has made a pleasant cake, using decent maocha, and probably tried to beef up its value by buying some Dayi neifei and wrappers. Strip away all the claims to Menghainess, and it's still very enjoyable - but not worth the price of admission, I suspect! I don't think I'd be quite so ready to try a fake shupu for fear of dying, but shengpu - absolutely! Thanks again to DJC for the generous sample. Regular readers may remember that Lei and I switched from our previous kettle (the popular Kamjove induction system) to the above set-up. In a previous article on the heating-via-induction process, I mentioned that we made the change because the inductor was (i) noisy, due to its fan; (ii) irritatingly "beepy" due to the electronic noises it makes in response to every pressed button; and (iii) subjectively discomforting due to the presence of a high-frequency induction coil. Maybe you don't find the latter to be a problem. The induction system certainly has its advantages: it is extremely efficient at heating water, and so there's very little waiting for water to boil. However, I usually only sit down to a proper gongfucha session if I am deliberately trying to slow down, and have an hour or two to spare. These days, that means Saturday morning, or Sunday before heading out to chapel, unless I sneakily grab a session before heading into work. So, quick boiling isn't a very high priority for me. In fact, you know, the gradual process of the tetsubin is actively positive. It slows me down. It slows. Me. Down. I like being forced to be slow. It empties out all the nonsense from my head, usually filled with half-formed plans and concerns. Papers. Chapters. Projects. Students. Positions. 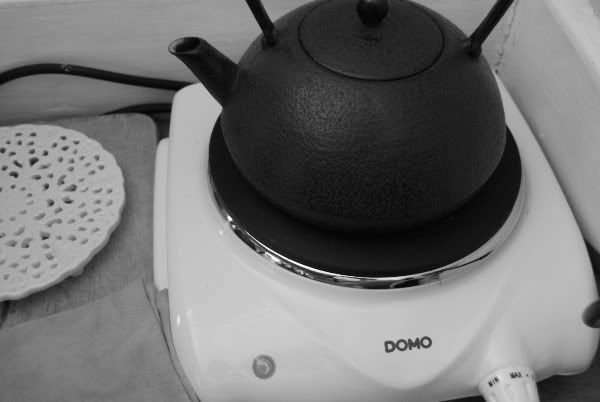 Using the hot-plate pictured above, the tetsubin takes about two or three times as long to boil water as does the inductor. And I like that very much. Doesn't that sound pointless? However, it doesn't work like that. 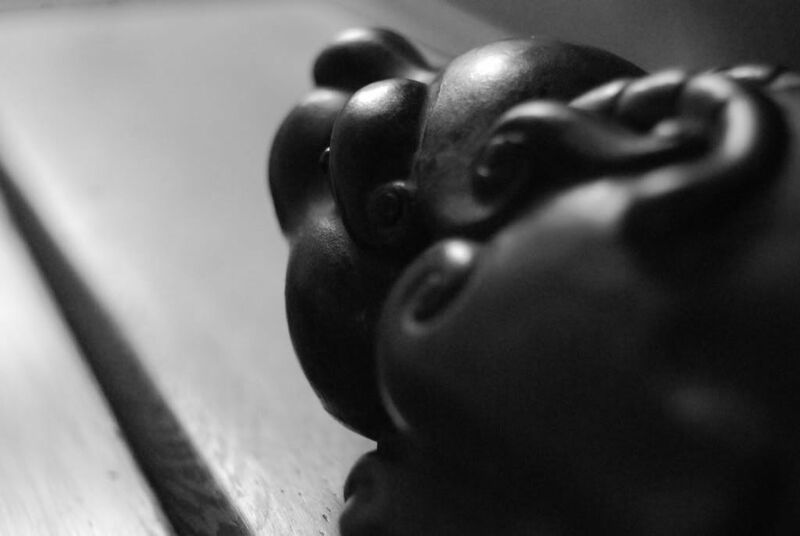 There's something tangible and real about the tetsubin. Its slowness has turned out, unexpectedly, to be a positive boon. What do I do while waiting for it to boil? Nothing. I do nothing, or at least I try to do nothing. And, as every practioner of zazen will tell you, that's a very hard thing to do. The results I find to be highly beneficial. I've got used to our dear tetsubin in the last four months, such that it is now an unconscious part of my routine. I have learned its sounds to help my understand the temperature of the water, and have reached a good state in making tea intuitively. As always, the process of improvement is a constantly ongoing one. I'd like to describe some points that I've come to find useful in using my tetsubin. Of course, this is (as always) what "works for me". My eternal advice: think about it for yourself. (ii) After filling the pot, this leaves me without enough water remaining in the tetsubin for another pot. I put the tetsubin on our iron trivet (the round, white object to the left of the hot-plate in the above photograph), and remove its lid. The kettle and the water inside begin to cool, and I turn my concentration to the infusion taking place in the pot. While I mess around brewing the tea, the kettle and its water continue to cool on the trivet. (iv) Now, I have 50% new water in the pot, and only 50% from the previous infusion. Over time, it is reasonable to assume that this remaining fraction of water in the pot decreases by half each time, so that the water is never too old, nor kept hot for too long. That works for me. I read an article some time ago on a vendor's web-page that said tetsubins were unsuitable for shengpu. I know several teachums who were actively dissuaded from buying a tetsubin by this article. It's very dangerous for people to write such statements - particularly without providing any explanation, as did this article. Zen Buddhists have a tradition of avoiding definitive statements for this very reason: it is dangerous to say something that could mislead a listener, and it may be better to say nothing at all. To offer contrary evidence to the article, I have found the water from a tetsubin to be highly complementary to shengpu, both young and old. These are not definitive statements: I urge you to understand that these are my opinions, and at best relate to the water I use (bottled spring water), to the tea that I drink, and to my method of brewing. I have found the results to be pleasant, and I suggest that you come to your own conclusions, if possible, by trying out a tetsubin for yourself, if the opportunity arises. To my reckoning, the water is smoother than that obtained from our induction system. It is "rounded", gradual, and more mineral, when consumed plain. When used to brew tea, I have found its mineral character to emphasise shining high-notes that I previously did not detect, and to amplify the effect of the huigan [swelling return-sweet character in the throat]. In engineering terms, it amplifies "higher frequencies" in the character, such as the ringing high notes, the aroma, and the huigan, and it attenuates roughness. 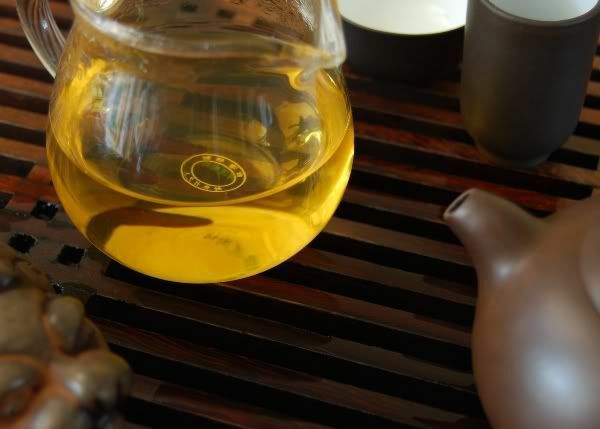 My plantation teas taste much more palatable with tetsubin water, for example. Bass notes, such as leather, tobacco-like undertones, seem largely unaffected - if not a little more smooth. There is a difference, and you may not like that difference - so try it, and see for yourself. I like the difference, and I would not recommend the "unsuitable for shengpu" statement for the general audience. It is very important to dry your kettle after use. 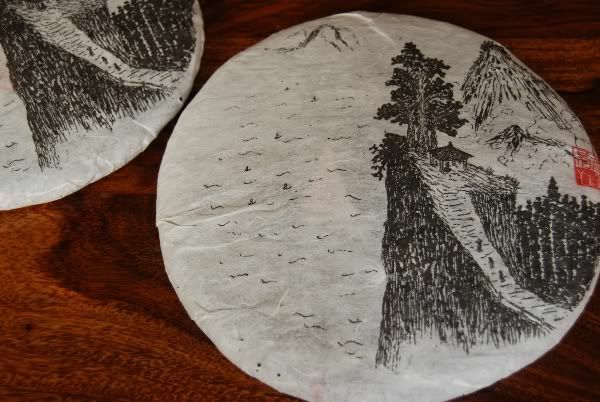 Happily, this is very easy: when the hot-plate is finished after use, just leave the empty tetsubin on it for a half-minute, and the residual heat will evaporate the thin film of water remaining on the interior of the kettle. Don't leave it sitting too long, as heating without water (even on the cooling-down heat of the used hot-plate) will not be beneficial taken to the extreme. One thing I learned was that it is very easy to leave water in the tetsubin and forget it! I habitually used to neglect my induction kettle in this way, and come back to the tea-table the next day to find that I had left water in it. No problem, the induction kettle was protected from oxidation. The tetsubin, however, is not so well protected, and needs careful attention. Don't run off and leave your kettle with water in it! I don't get into the capital very much, but it's just an hour away. Yesterday, I visited UCL (University College, London), a place to which I haven't been since applying to universities for my undergraduate degree. The grandeur and beauty of the architecture are astounding - we don't get anything on this grand metropolitan scale in Oxford. The main building, pictured below, reminds me of St. Paul's Cathedral in London, or Capitol Hill in the USA. After three hours spent talking about engineering with the locals, I found myself in the centre of London with an hour in hand - therefore, time to head to TeaSmith. If there are any other decent tea venues in London, I haven't heard of them! Nada's qiaomu [tall tree] Yiwu xiaobing had arrived, complete with a pretty wrapper carrying the TeaSmith logo and Nada's stamp. 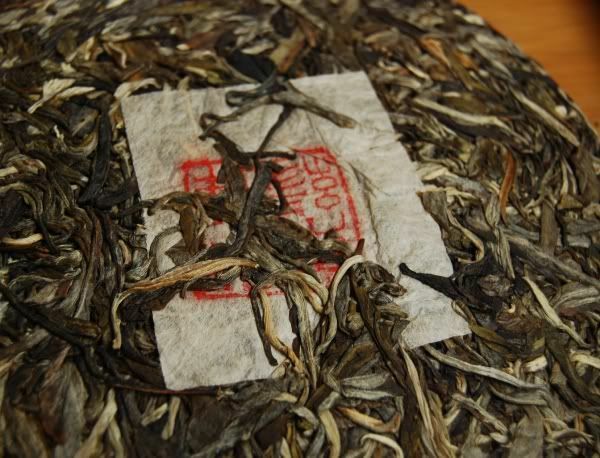 Familiar with that tea, I headed into the 2003 Yiwu that TeaSmith have carried for some time. Wet-stored in Hong Kong, as far as I can tell, but very woody and smooth, the girls behind the bar were kind enough to infuse its leaves throughout the duration of my visit. They also allowed me some tasters of a 2009 Shanlinshi wulong that I understand comes from Tea Masters, which was delicious. 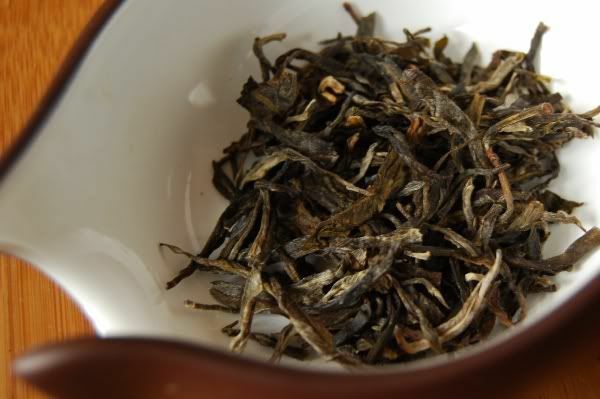 It was vivid, packed with energy, and with an aroma that lasted forever - just what I look for in a qingxiang wulong. Happiest of all, there were customers in TeaSmith that seemed to know quite a lot about tea. Usually, as you'd expect given that proper Chinese tea is generally unknown, the clientele don't know too much and need plenty of tuition and explanation from the TeaSmith staff. This time, I listened with joy as an undergraduate with spiky black hair told his friend (a girl with bright pink hair) the finer points of brewing tea. Impressive! I should be spending my free London time in the galleries, I suppose, but the chance of drinking tea with like-minded souls always seem to win me over, and I find myself heading out to Spitalfields. Thanks again to the staff for another memorable visit. Summertime. I fear it is with us. No longer may a man dress as he wishes; he dresses as he must. Stow away the long scarves, hide away the hats. Any season where I can't wear a waistcoat for fear of expiring from hyperthermia is a season I dread. 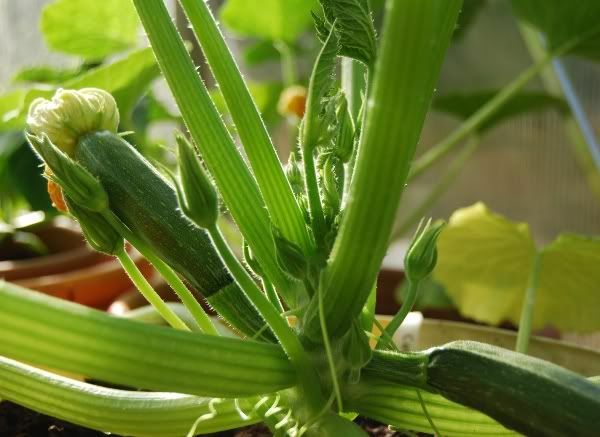 On the bright side, we've been spending more time exploring the garden of our new house, and seeing what the previous owner has been growing in it. While undoubtedly miniature in comparison to the wide expanses of American homesteads, it is our first home of our own, and so it feels very special indeed. 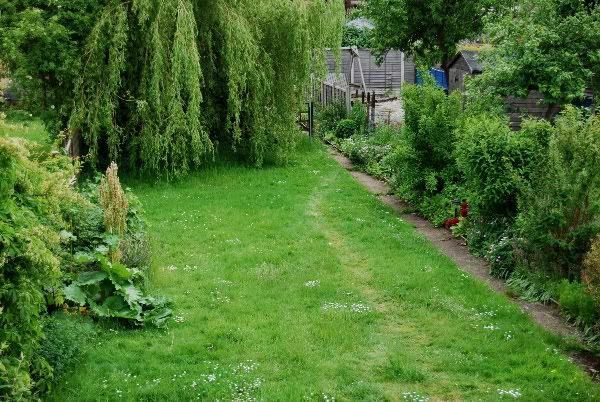 Believe it or not, the colour of the garden is precisely this green, with no alteration. Fans of Heidu (your name is Legion, for you are many) will be happy to know that, despite being inflicted with feline diabetes, fleas, and a stench straight from the bowels of Hades, he is back among us. 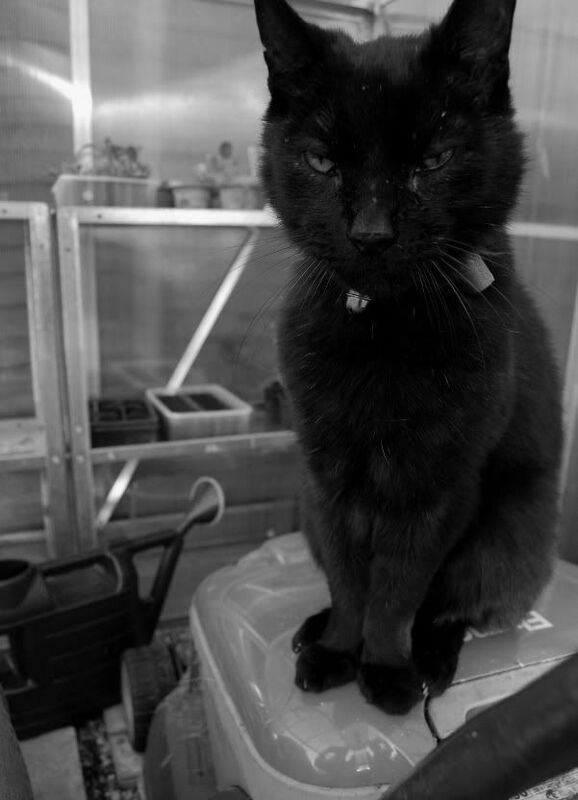 In fact, he just likes to follow us around the garden and hang out wherever we go, which is very sweet. The pleasant smells of flowers and vegetables almost overcome his pungent aroma, too. Almost. Lei and I were very touched to read e-mails and comments giving us advice on how to combat Heidu's manifold problems. Much as we'd love to solve them ourselves, his real owner (our neighbour-but-one) is a lovely family lady, who loves him very much. We're attempting to mention his fleas as tactfully as we can manage. Thanks also for the generous e-mails regarding my on-going slog, career-wise. I may have painted too bleak a picture, for the news is good: I am happy to report that I secured a very pleasant five-year position with my current boss (actually, this was entirely due to his continued generosity), and was elected as a Fellow of a college here - an honour I feel largely undeserved given my humble junior status. Maybe I can get the college to institute the position of a "tea steward", to go alongside that of the traditional wine steward - heaven knows, their tea is bad enough, as it is everywhere here! This is my first shengpu session in a long, long time, simply because time and tide have kept me away from my tea-table (see entries passim). To get back in the mood, and to prepare the ol' tastebuds for the onslaught of a whole new year of tea, I thought I'd start with a good one. 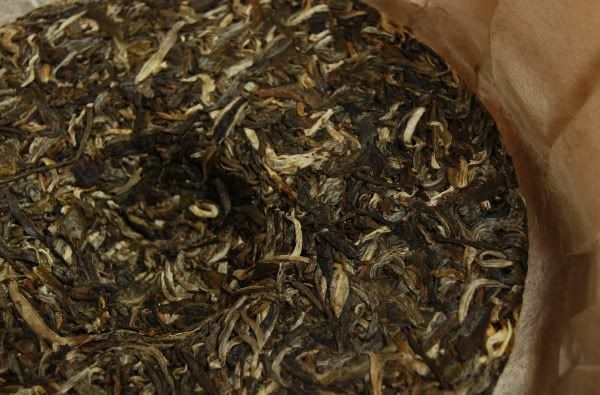 I bought this tea from Nada, who selected it during his recent 2009 expedition around Yunnan, and comes from a village named Mahei, in the Yiwu tea-zone. 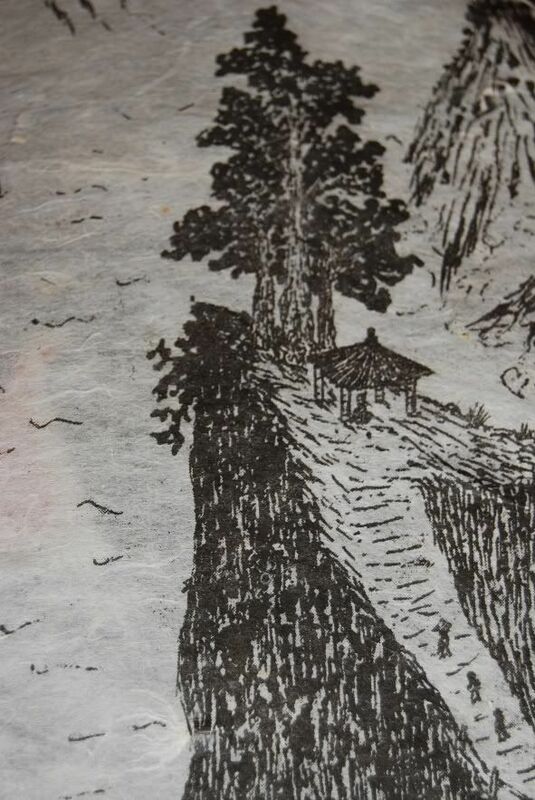 The wrapper alone (pictured above) arrests my attention, as I am extremely fond of traditional Chinese landscapes. Their impact is as much in their use of the white space of the canvas as it is in the detail, and I appreciate the restraint and suggestiveness of classical Chinese artists in this genre. I understand Nada negotiated with the artist himself in order to produce the wrappers, which is A Good Thing in my eyes. 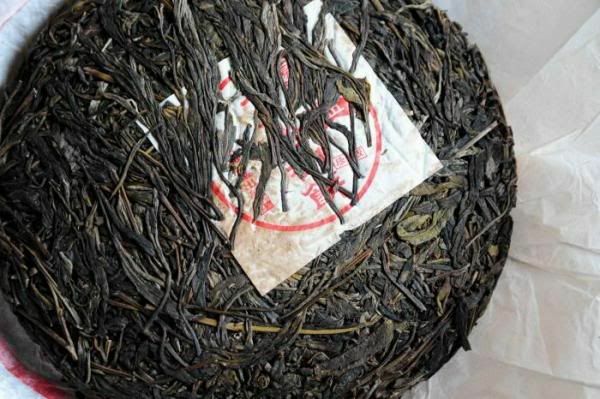 The maocha is entirely qiaomu [tall-tree], which took some darned hard work, as far as I can tell: even during the high point of the season, the sellers in Yiwu itself mix their product with plantation leaves to make it go further. This may or may not be made from the same maocha as are the cakes at TeaSmith, which I long to try. 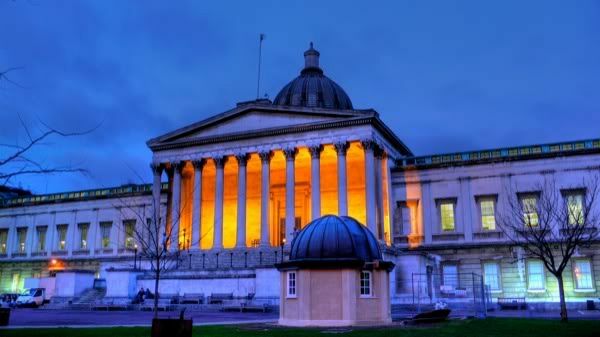 Actually, I'm coming to University College in London tomorrow, so I should I do exactly that! The compression is excellent: firm, but not Xiaguan, and the leaves are sizeable and whole, with a clean and sweet aroma. 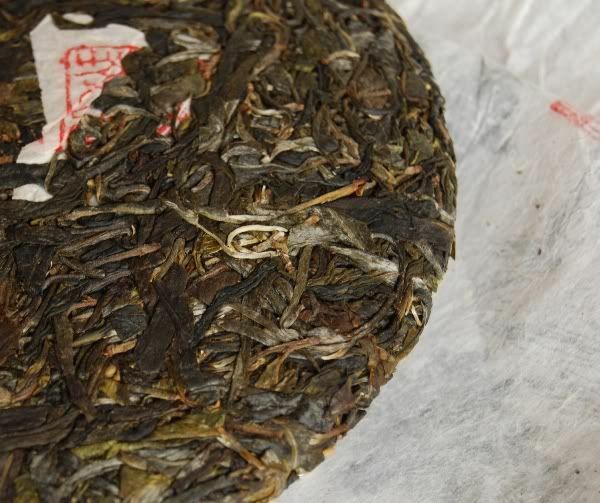 My impression of the Yiwu qiaomu (actual qiaomu) maocha from 2008 was just that: clean. The soup is pure, crystalline yellow, with the expected short-but-sweet beidixiang [initial scent] swelling to a long, climactic lengxiang [cool scent] of low sugars that lasts an absolute age. 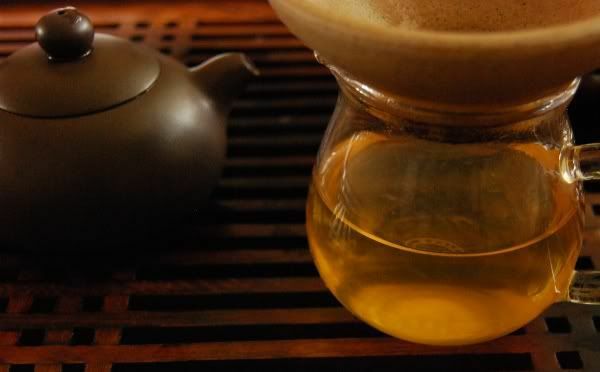 It dwells in the wenxiangbei [aroma cup] for several minutes, solid and potent. The characteristics are mobile in the mouth: sweetness that moves to the throat and swells in as similarly dramatic manner as did the aroma. "Wow, this is so pure. Is it old-tree?" asks Lei, without knowing which tea it is. The purity and energy are remarkable. It marches on forever, simply becoming sweeter and sweeter. Middle infusions fill out into a sweet-leathery affair, which recedes to pure, elegant sweetness by the eleventh infusion. Even then, the mouth continues to water after swallowing. There's plenty of content in these leaves. After twenty (!) infusions, it being a slow and leisurely day, the tea continues to deliver solid sweetness and mouthwatering after-effects. 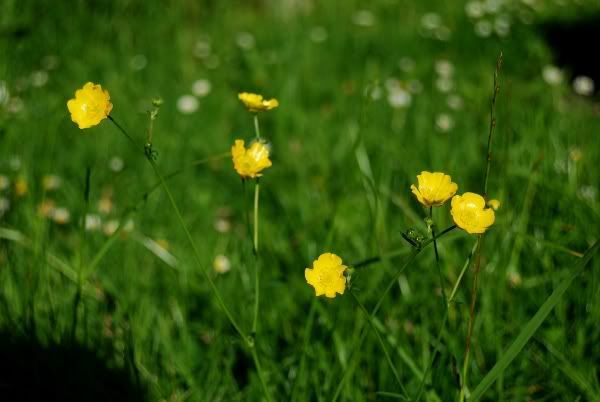 Even then, it continues to swell in the throat, and is entirely devoid of any roughness or abrasiveness. Nada should be very pleased with his production. Due to pressures of time, other cakes bought from him remain in their boxes in my office, and have yet to be transferred home, but I look forward to doing so. Here's to a great 2009 tea season for all of us. This cake has darkened noticeably. It has become vegetal and bass-like, while retaining a potent kuwei. The body remains thick, but it has shifted significantly in the heavier, downward direction - in a good way. 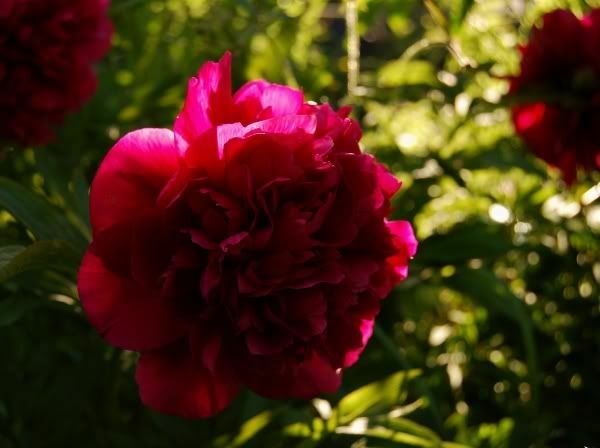 It lasts for a very large number of infusions without sign of difficulty, and has the cooling sensations and brilliance of character that remind of its raw youth, three years ago. I conclude that the aging conditions are sufficient for looking after this cake's future, and, in particular, that the humidity of the air is not stripping it of its character.